The Amateur Softball Association -- ASA -- sets rules and regulations for softball. Also known as the Junior Olympic program, the ASA's youth division is one of the country's largest kids' sports organizations. Governing men's and women's softball, ASA rules are modified to accommodate players' ages. 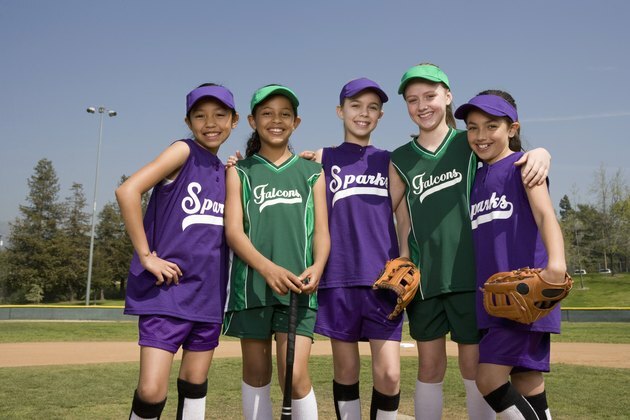 There are specific rules for fast-pitch and slow-pitch softball in the 12 and under division. In the 12U division, nine players per team take the field for fast-pitch, and 10 players per team take the field for slow-pitch due to the addition of a short fielder added to the outfield. A team is allowed 20 players maximum on its roster in both versions of the sport. Games go for seven innings in 12U baseball. The run-ahead rule kicks in if one team is ahead by 15 after three innings, or eight after five innings in fast-pitch. This rule is enacted if one team is up 20 runs after four innings or 12 runs after five innings for slow-pitch. The game ends when these limits are reached. Steals are allowed in 12U fast-pitch games. They are not allowed in 12U slow-pitch games. Helmets must be worn at all times by batters as well those who are running bases. The ball for 12U fast-pitch is 12 inches and 11 inches for 12U slow-pitch. Base paths are the standard 60 feet for both versions of the game, but pitching distance is 40 feet for fast-pitch and 46 feet for slow-pitch. How Far Is a Kids Free Throw Line in Basketball? What Is the Size of a Half-Court Basketball Court?